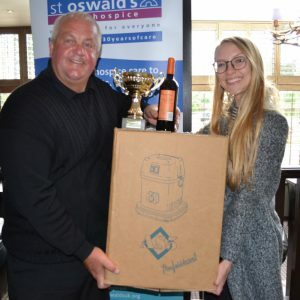 At the recent AHCP Charity Golf Day at The Slayley Hall Golf Club this years nominated charity was St.Oswalds Hospice which is based near Newcastle and provides specialist hospice care to North East adults, young people and children with life-limiting conditions. 19 players attended and played the challenging Hunting Course where the European Seniors Event was played last year. The weather was very windy and the course was playing very long but Duplex’s Mike Conroy triumphed by winning the competition with the winning lady player being Mrs Judith West. Mrs Natalie Santamera from the hospice attended the prize presentation in The Claret Jug Bar and Duplex were delighted to support the good cause by donating a commercial vacuum cleaner to the hospice who have been a valued customer since 2010.